Atlas Equator 2.0 OFC review | What Hi-Fi? The first thing that hits you about the Equator 2.0 (besides its tactile and silky-smooth outer jacket) is the way it allows an impressive sense of weight and power to music. If it were a physique, we’re talking the broad-shouldered body-builder type. Play some hip-hop or dance such as Daft Punk’s Contact and the Atlas allows the music to fly, making its presence felt but not completely dominating proceedings. 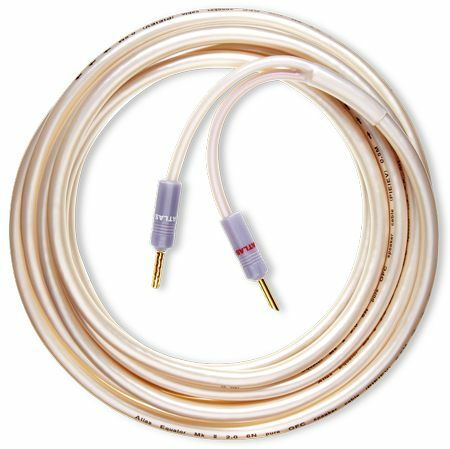 The cable actually promotes an extremely clear and unadulterated sound, which doesn’t hold back on detail either. The only area where the Atlas really falls down is that, over the long-term, you realise it doesn’t make for the most exuberant or inviting of listens. There’s a nagging feeling that the cable is holding back a little – auditioned next to the QED Ruby Anniversary Evolution or Wireworld Luna 7, our reference setup sounds a touch flat and uninvolved.